I was prompted to write this by a recent visit from our graduate trainee Katie Mann. Katie was looking for archive images and inspiration for her exhibition in the Library highlighting LGBT Month. Our archives concerned with peace campaigns and nonviolent protest often overlap with gay and lesbian activism, as in these examples which I showed Katie. This image is from the Peace News Archive, an immense collection of information and photographs on campaigns, countries and themes of interest to those creating the newspaper, including a file of fantastic photographs of lesbian and gay protests from the early 1980s. 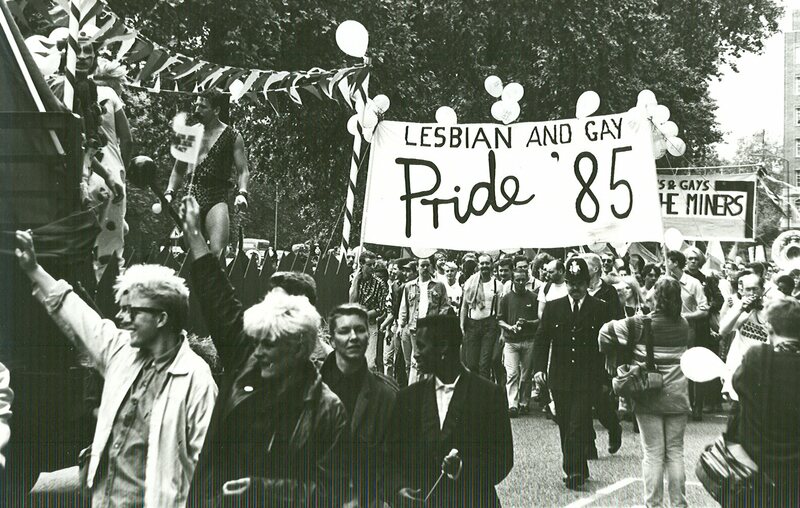 This one shows marchers on a Lesbian and Gay Pride March 1985 and is very evocative of the styles and politics of the era. 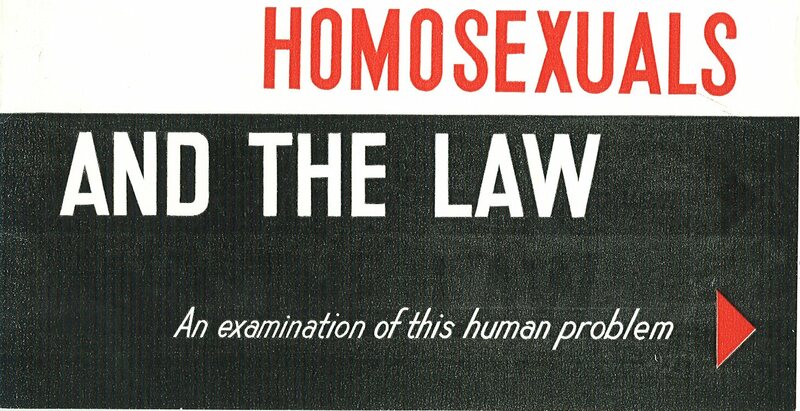 As in its way is this striking little booklet, from the Archive of Jacquetta Hawkes, part of a file of correspondence concerning her work for the Campaign for Homosexual Law Reform and the Albany Trust. Throughout her life Jacquetta (like her second husband, J.B. Priestley) campaigned against injustice, using their star power and connections to influence political decisions, in favour of often controversial causes. For instance, the couple played a key role in the creation of the Campaign for Nuclear Disarmament. I suspect that our large collections of peace-related pamphlets and ephemera, which we hope to catalogue this year, will yield further stories and pictures of LGBT campaigns … watch this space! Posted in Hawkes, Jacquetta, Image of the Month, Images, Peace, Politics, Priestley, J.B.
One of the most significant, exciting and beautiful archives in Special Collections is that of archaeologist and writer Jacquetta Hawkes. There is now a revival of interest in her great contribution to raising public awareness of Britain’s deep past during the 1950s. Her masterpiece, A Land, which unforgettably fuses archaeology, geology, poetry and personal experience, has been reissued by Harper Collins. This book is explored and revisited, using manuscripts and photographs from the Archive, by Dr Christine Finn in a new exhibition at Yorkshire Sculpture Park this autumn. Find out more about Jacquetta, the Archive, the book and the exhibition on our Celebrating Jacquetta Hawkes website. 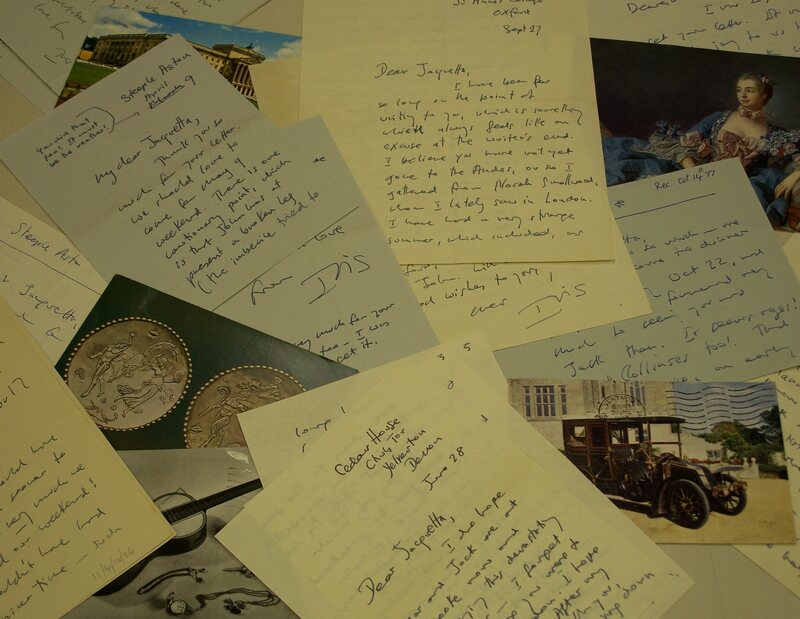 Find out more about Jacquetta Hawkes’s amazing life and unique writings on our webpage for her Archive and in this online exhibit on the Celebrating Jacquetta Hawkes blog. As ever, the latest edition of the J.B. Priestley Society Journal offers new light on many facets of Priestley. Tom Priestley reflects on family history as shown in the 1901 and 1911 censuses. What was JB’s grandfather’s occupation? Useful reprint of Norah Fienburgh’s 1932 Bradford Pioneer piece on Priestley’s 1913 Round the Hearth series. Priestley turned again and again to the ideas of Jung: both believed in the power of dreams as a creative force: Lee Hanson’s lecture on the relationship between the two usefully summarises Priestley’s explorations of Jung’s often difficult ideas and covers how J.B. and Jacquetta Hawkes used them in Dragon’s Mouth. Alan Day covers the February 1948 British Theatre conference, chaired by Priestley. Fascinating controversies on the role of theatre managers and insight into the theatre of the time. Rangarao Kulkarni discusses consciousness and time in five of Priestley’s later fictions: The Magicians, Saturn over the Water, The Thirty-first of June, Lost Empires and It’s an Old Country. The Journal isn’t available online, but is sent in print form to all members of the Society and is available in libraries, including ours of course. Posted in Hawkes, Jacquetta, Literature, Priestley, J.B.
For National Poetry Day (6 October), some poetic links for Special Collections at the University of Bradford. The poets whose work we hold were inspired by the wider themes gathered by Special Collections, such as Yorkshire scenery, anti-nuclear campaigning, and archaeology. 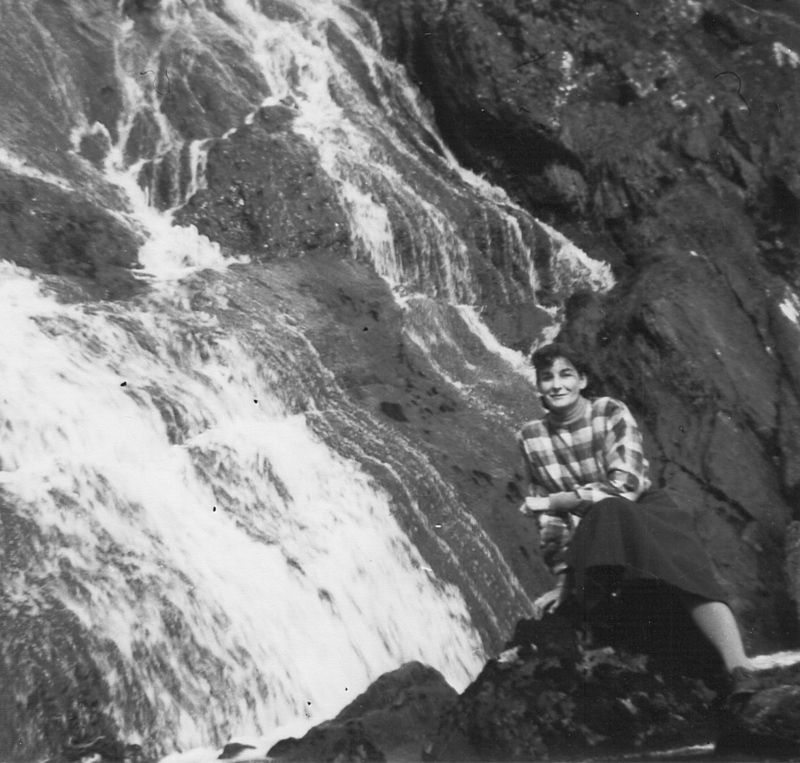 Jacquetta Hawkes was inspired by the past and nature to write many poems during the 1940s. In particular she turned a mystic experience into a marvellous poem, Man in Time. J.B. Priestley was not (he felt) a natural poet, but his first published book was actually a collection of what he later called “dubious verse”. We have plenty of poetry with a Yorkshire flavour. 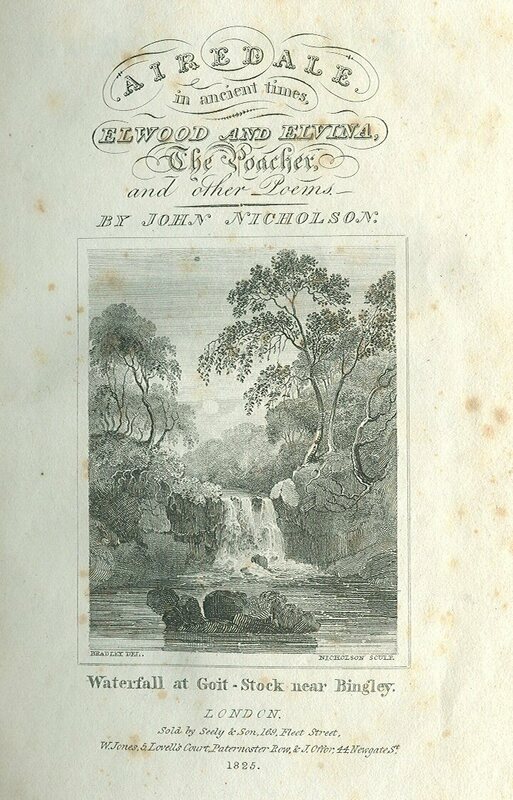 The Archive of Yorkshire author, John Waddington-Feather, includes work inspired by Yorkshire and the natural world. The Rev. Waddington-Feather also donated volumes of Yorkshire dialect verse by John Hartley, Ben Turner, F.W. Moorman and more. More local verse can be found in the Local and W.R. Mitchell book collections, including Airedale in Ancient Times, by John Nicholson, shown above. Reflective and campaigning verse appears throughout our peace-related archives, see for example the Archive of Adam Curle and the Papers of Sarah Meyer. The Mitrinovic Collection includes plenty of classical and modern poetry valued by Mitrinovic and his circle, in many languages notably Greek and Serbo-Croat. Try a Classmark search for ML/C on the library catalogue to see the poetry and other language/literature works in this collection. I particularly like a copy of Edith Sitwell’s Bucolic Comedies which she inscribed to Mitrinovic. The Peart-Binns Christian Socialist Archive includes material on poet, entrepeneur and pacifist Tom Heron. Finally, an update on the Sounds of Science Poetry Competition. See the winner, Emily Fioccoprile, reading her poem on Youtube. The entries and publicity will be added to the University Archive soon: it is fascinating to see how the authors interpreted the idea of science and the different kinds of poems that resulted. There is also a display in the J.B. Priestley Library of the winning poems. Posted in Collection of the Month, Hawkes, Jacquetta, History of Science, Literature, Priestley, J.B.
One of the delights of the archives of J.B. Priestley and Jacquetta Hawkes is the way they document the couple’s friendships with other artists and authors. Novelist and philosopher Iris Murdoch was one of these friends. This image shows her with Priestley outside Kissing Tree House near Stratford-upon-Avon, where he and Jacquetta lived for many years. 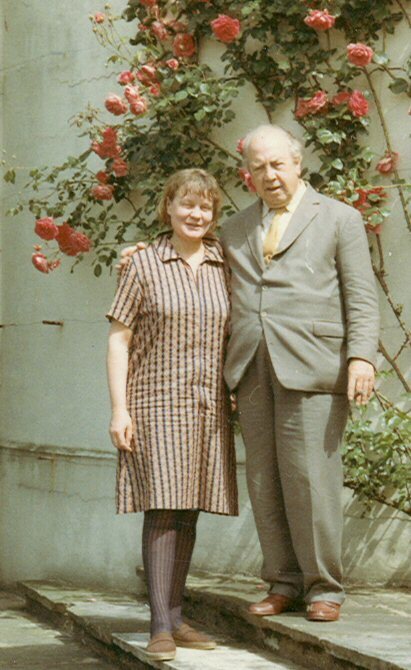 Iris Murdoch and J.B. Priestley outside Kissing Tree House, 1960s, photographer unknown. Iris Murdoch had met J.B. “some time in the 1950s on a BBC programme” (as she told John Braine for his biography of Priestley). She quickly became friends with him and Jacquetta, visiting their home on the Isle of Wight. She recalled in her foreword for Time and the Priestleys, the memoir of the couple by another good friend, Diana Collins, that she and her husband John Bayley and the Priestleys went for walks on the cliffs and drank “Dog’s Nose” (gin in half a bitter) in the pub. Iris admired and liked the Priestleys very much. As she said to Braine, “What a man, what a character, what an appetite for life! And I adored Jacquetta too – I’d never before met anyone so beautiful and regal. They really are king and queen figures! Yet Jack is also Falstaff …”. The link was one of work as well as friendship. In 1963, Priestley helped Iris to adapt her novel A Severed Head for the stage, greatly improving her original draft with his expertise in dramatic structure and dialogue, his “great theatre wisdom” as she put it. The play was a great success, running for over two years.